Adolph Zuker, Jesse Lasky and Cecil DeMile founded Paramount Pictures in 1912. It was only after Zuker and Lasky combined their business ideas and created Famous Players-Lasky Corporation, now known as Paramount Pictures. In 1920, Paramount Pictures became the first successful nationwide film distribution company and is currently considered to be part of the “Big Six” film studios in Hollywood. Paramount Pictures has released iconic films such as The Ten Commandments, The Godfather, Top Gun and Titanic . Paramount Communications Inc. and Viacom Inc. merged in 1994 and the deal was said to be valued at $8.2 billion . The current Chairman and CEO, Brad Grey, began his position in 2005 and continues to bring the company success. In 2013, Paramount began a new approach in the film industry by releasing fewer films but increasing their profits. Although domestic ticket sales have plunged to less than $900 million, Paramount has become consistently profitable. This is because of the studio’s profit margin that has been more than 5 percent for the past few years . Although, the 2013 tactic did not work out because Paramount Home Media Distribution’s revenue fell 38% as a result of fewer releases. However, revenue increased to $1.36 billion, which is a 12% increase from last year. The increase is primarily because of a strong theatrical performance from Transformers: Age of Extinction . Transformers: Age of Extinction captures the story of Optimus Prime and his Autobots fighting to save Earth’s history with the help from Optimus’ daughter and a mechanic. Transformers: Age of Extinction was released on June 27th and hit a box-office milestone by reaching $1 billion worldwide. This is only the second movie that has ever hit this mark in the toy-to-film franchise. China showed the biggest contribution by selling $300 million in ticket sales . With performers such as Mark Wahlberg, Stanley Tucci and Nicola Peltz, the movie has received 8 nominations and won 1 award . Interstellar is based on a team of explorers that travel beyond our galaxy and discover the future among the stars. The Sci-fi film starring Matthew McConaughey and Anne Hathaway was released on November 5th in the United States and internationally. The film had pleasing results when it was first released in 3,561 theatres and averaged $13,342 per theatre. During opening weekend, the movie made $48 million domestically and was ranked #2 following Big Hero 6. The film has accumulated grosses of $147 million domestically, which accounts for 27.1% of the entire gross, and $542 million worldwide. The budget is estimated to be $165 million therefore the gross income quadrupled their budget. Interstellar is nominated for the Hollywood Music in Media Awards and already won the Truly Moving Picture Award in the Heartland Film Awards. Men, Women & Children follows the story of a group of teenagers and their parents discovering how the internet has impacted lives. The drama film starring Adam Sandler and Jennifer Garner was a flop for Paramount Pictures.The domestic total gross is estimated to be $705,908. There was a limited release date, October 1st, that was only shown in 17 theatres and averaged $2,825 per theatre. The wide opening weekend was released to 608 theatres and only averaged $504 per theatre. According to BoxOfficeMojo, these results are the fifth-worst ever for a movie on more than 600 screens. Although Adam Sandler is a popular actor, that wasn’t enough to bring out a huge audience. Men, Women & Children did not get a strong response from the Toronto International Film Festival  and the critics on Rotten Tomatoes were not a fan of the film and gave them at 31 percent. Also, the movie was competing against another R-rated movie, Gone Girl, which was a big hit in the marketplace. In mid-October, investors took Paramount Pictures to trial claiming that the studio secured a “risky business strategy” when it obtained $40 million in financing. The investors are upset that the movies released during the mid 2000’s did so poorly. The investors were asking for $16 million and punitive damages in which they claim amounted to fraud. Both sides agreed with the films disappointing results in the box office therefore the investors argued that it is unfair that Paramount didn’t disclose it’s plans to reduce international distribution . The US judge dismissed the case by ruling the evidence “inconsistent with the investors claims,” therefore Paramount Pictures won the lawsuit . Paramount Pictures is ranked as the #6 studio in the overall studio market share with a 10.4% market share. Overall, they have released 11 movies in 2014 and generated $953.6 million . Paramount Pictures plans to create a Hollywood-inspired theme park that would include water parks, restaurants and hotels based on Paramount’s movies . The resort plans to open at Easter 2020 and create close to 27,000 jobs. 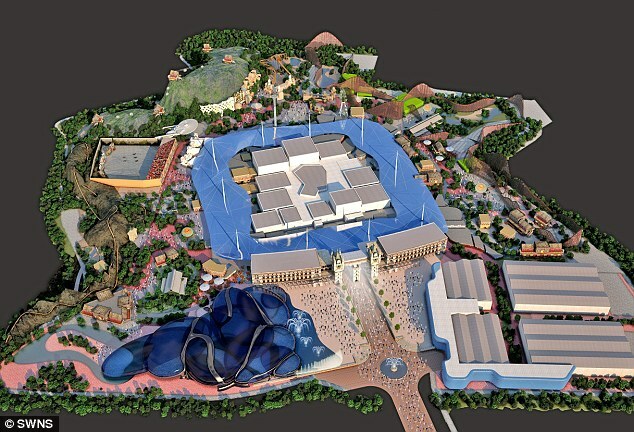 The London Resort Company Holdings (LRCH) is in charge of the plans for the theme park. The location is set to be in Kent, which is very close to London . On December 1, 2014, Viacom shares were down 1.44% at $74.54 a share. Although this is not the highest market share, it is a rebound from the company’s low point in October ($68.24 a share) but nowhere close to the company’s high point this summer ($87.31 a share, in July) . The comedy film from writer-director Chris Rock is set to release a limited screening of Top Five on December 5th. The wide release date is set to be December 12th. Top Five follows a comedian attempting to become a serious actor but ends up broadcasting his wedding with his fiancé who is a reality-TV star . At the Toronto International Film Festival the comedy garnered positive attention therefore it is expected to do well .